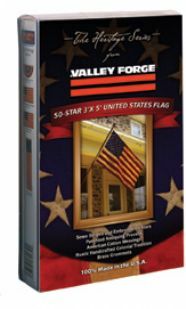 This 3'x5' antiqued cotton Heritage 50-star flag comes with brass grommets. This flag has sewn stripes and embroidered stars. Flag is 100% made in the U.S.A. The Heritage Series product line combines unique handcrafted workmanship with a patented antiquing process that is a hallmark within the industry. 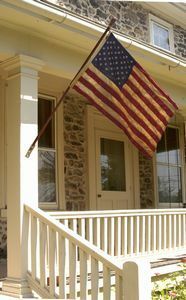 Each item within the Heritage Series is 100% made in the U.S.A.
All Heritage Series products are constructed of carefully chosen American cotton that is also meticulously dyed to create a traditional, colonial feel.